If you have employees, you have drivers. Their off hours crash related injuries are carried in health-care related costs to your company, and the total costs are staggering. You may not think of your business as having a fleet of vehicles, or an army of drivers; but most likely you do. If you have employees, you have drivers. Their off hours crash related injuries are carried in health-care related costs to your company, and the total costs are staggering. In this book I’ll do my best to describe the findings of the new NETS study, help you relate them to your organization, and offer a sensible strategy to help you reduce the burden to your company. 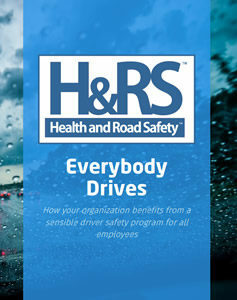 “Everybody Drives” is intended to assist Human Resources executives in understanding the relationship between company and employee drivers and ways in which they can protect their assets – both financial and human. Everybody Drives | September 2017 (pdf, 21 pages, 1.09MB, Rev.1).